Dec 2011 Article published in HoteRes magazine, Ohta publications Inc., Tokyo Japan. Golden Fry Tech is a safe oil preserving plate made of specially processed titanium. It has a semi permanent effect, which offers great advantages to users. When contacted by oil of 100 - 200°C during deep-frying, Golden Fry Tech uses the thermal energy of the oil to prevent oil degradation and reduce sticking of excess fat. As a result, it keeps oil from polymerizing, prevents rises in viscosity, minimizes oxidation and reduces smoking, odors and blackening. The four major causes of oil degradation are 1)contact with oxygen in the air,2) heating that causes thermal polymerization and cracking (augmented the higher the temperature), 3) hydrolysis caused by moisture in fried foods, and 4) substances released by fried foods. Within the degradation process, three changes occur because of heating. Fryer oil is simultaneously oxidized by oxygen in the air, hydrolyzed by water, degraded by substances released from foods, and thermally polymerized and cracked by heat. These processes cause oil oxidation, rises in carbonyl value and viscosity, smoking, odors and blackening. Golden Fry Tech prevents frying oil degradation because oxidized titanium slows oil oxidation, hydrolysis, and thermal polymerization and cracking, thus minimizing oil oxidation, rises in viscosity, smoking, odors, foaming and blackening. It is currently being used at two Seven Eleven stores in Japan that are serving as monitors. Their comments are below. 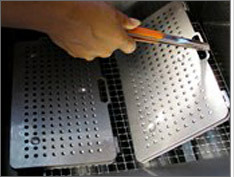 The Golden Fry Tech plates were lent for a two-month period from November 25, 2010 to January 28, 2011. The fried food menu they were used with included fried chicken. French-fries, frankfurters, hotdogs and croquettes. "Before using the Golden Fry Tech, we changed our on every three or four days, but after introducing it, we were able to use the oil tip until a seventh clay. Also the all drains smoothly. When washing the fryer, the grime comes off easy, which makes us happy. Foods fry more quickly as well. Our frankfurters keep their color even when set out for a while after frying." Koji Tomita, President of LI H Corporation, showed his confidence in the Golden Fry Tech by saying, "in this current age of ecology, it is necessary to greatly reduce our excessive use of oil. Moreover, because of today's health consciousness, people are demanding quality in the fried foods they choose. Our Golden Fry Tech healthy ecological plate is drawing attention as a product that meets both of those needs. Moreover, we have patented it internationally and is made with proprietary know-how no one can imitate, so we expect it to make a strong impact on markets." May 2012 Article published in Star Advertiser, Honolulu, Hawaii. The oil was dark and old-looking, but the spicy chicken Colin Nishida cooked quickly was light and crispy, not greasy, moist on the inside and delicious throughout. That's what one would expect from the chef and owner of Side Street Inn on Da Strip (as well as the original, on Hopaka Street), but a secret ingredient was at play here. The paper towels upon which he drained the chicken had only small spots of oil on them, not large pools or blotches. With the surge in news about obesity in America, the timing for such a product is "perfect," said Koji Tomita, president of LTH Corp., which has the exclusive rights to import the Golden Fry Tech oil-saving plate outside Japan. Golden Fry Tech, which LTH Corp. took from a handmade product to mass production, is a square titanium plate full of pukas, encased in a stainless steel "folder" with pukas that line up with those in the titanium. It sits in the oil and works its magic, saving Nishida about five 35-pound containers of cooking oil a week at his Kapa­hulu restaurant. LTH has lined up Hono­lulu-based Koha Foods as its primary Hawaii distributor. Nishida is among the happy Hono­lulu restaurateurs who have bought the kitchen tool for $1,200. Others include Koko­ro­tei and Sushi Iza­kaya Shinn, Lobster King and Jimbo Restaurant. Others are trying it out. "According to Jimbo, they'll save about $4,000" a year on cooking oil costs, Tomita said. Jimbo cooks tempura for its noodle dishes and other dishes, "and you know how fast, with tempura, the oil dies," Nishida said. "Especially ebi (shrimp), the flavor goes into the oil." However, the Golden Fry Tech also helps reduce flavor transfer, executives say. Nishida has one fryer dedicated to seafood to make sure his "chicken tastes like chicken" and not, say, shrimp, but other restaurants might not have the luxury of multiple deep fryers. The Japan-based inventor, which was trying to create a filtration system, had the accidentally invented product tested for various benefits, but LTH Corp. realized it had to build its own credibility on U.S. soil. Honolulu-based Food Quality Labs, formerly a C. Brewer company, was hired to conduct scientific testing. It found that placing the plate in a 35-pound to 50-pound deep fryer, with proper maintenance, reduces oil absorption, thereby reducing fat and calorie counts. It also reduces cooking time, oil-degrading oxidation and cooks' exposure to smoke rising from old, oxidized oil. It also reduces acrylamide content in the food. Acrylamide naturally occurs in the cooking process and has been linked to cancer. Lab testing found a 10.4 percent reduction in acrylamide in french fries and a 16.4 percent reduction in chicken cooked in canola oil with the device. Koha, an importer, manufacturer and wholesaler, has started marketing the product to those on its client list. "A lot of times I'm in the customer kitchens, and I see all this oil being used," said Jonah Miya­hira, who deals in seafood sales. "We came across this plate, and if it works for our customers, it's a no-brainer. We're already servicing these guys, and (the plate) is something that can help them save money. We thought that was a good match." The product has a three-year warranty but should last longer than five years with proper care, Tomita said. LTH plans to first concentrate on the commercial market and wouldn't mind getting an audience with a certain national chain, but also would like to introduce the product to the school system. Later on, Tomita said, a smaller version will be released to the retail market for folks who fancy a good crispy deep-fried treat at home once in a while. Remember Mari Taketa's recent blog about tonkatsu, where she claimed Ginza Bairin was moist, but I disputed it? Turns out, we may have both been right. I visited Bairin a long time ago, and she visited recently … probably since they installed new technology in their katsu fryer. I just found out that Bairin has started using Golden Fry Tech (GFT), which is a titanium catalyst plate encased in a stainless steel jacket that you place into a commercial fryer. 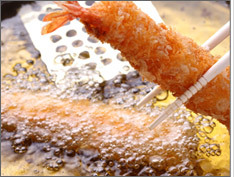 It was originally invented to help the food industry save on the rising cost of cooking oil, but it was recently tested by many international laboratories, including Honolulu's FQLabs, and they found the plate cuts food oil absorption by up to 50 percent (and effectively reducing fat calories by 50 percent) without altering the flavor and enhancing the texture of fried foods. Locally-based LTH Corporation recently did a GFT demo for me at Makino Chaya (since they turn out a lot of tempura every day) to show how it works. Used by simply placing the GFT plate into any standard fryer, many local restaurants and chefs including Side Street Inn, Lobster King, Makinochaya and Sushi Izakaya Shinn have already purchased GFT and are discovering the benefits in cost savings and enhanced flavor of their foods. 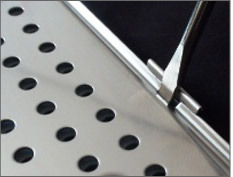 "Since placing the Titanium plate in our deep-fryer, we have noticed a significant difference with our daily usage...about 40% reduced savings in oil...The oil doesn't break-down as fast as normal and it doesn't affect the 'taste factor' in our food products. It's a great product and is beneficial to our business!" says Colin Nishida, Chef and Owner of Side Street Inn. The main technology behind GFT is that it reduces oxygen - one of the main known causes of oil degradation - from coming into contact with cooking oil. And, unlike filters which only remove debris from cooking oil, GFT also helps to breakdown and neutralize odors from chicken blood, seafood juices and food born contaminants. It also reduces acrylamide, a naturally occurring chemical compound in cooked foods that have been shown to cause cancer. The use of GFT also helps to condition cooking oil so that foods cook up to 34% faster and at lower temperatures, thereby reducing the cost of energy as well. The annual cost savings for a restaurant that uses a standard 35-lbs. fryer could be upwards of $14,000. The financial benefit is tremendous but in these days of environmental consciousness, the impact that GFT may have in lessening the use of oil is drawing great attention as well. "In this current age of ecology, it is necessary to greatly reduce our excessive use of oil. Moreover, because of today's health consciousness, people are demanding quality in the fried foods they choose. Our Golden Fry Tech healthy ecological plate is drawing attention as a product that meets both of those needs. We have patented it internationally and is made with proprietary technology no one can imitate, so we expect it to make a strong impact on markets worldwide" states LTH Corporation President Koji Tomita.